From Mr. Green, the Hibernia, to Mr. Lewis. 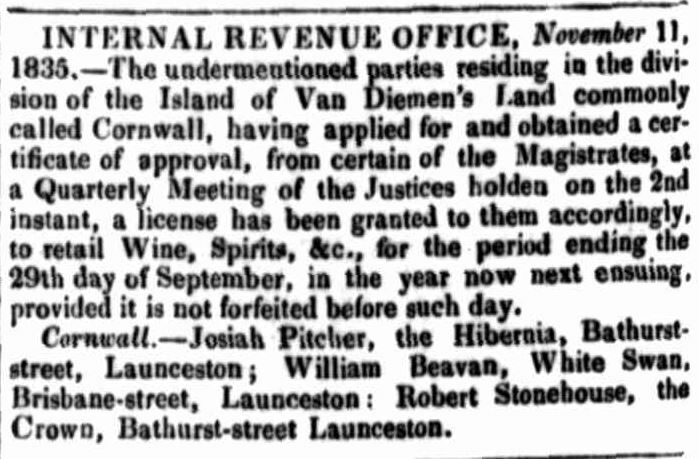 Captain Gardiner in assenting to this application, told Mr. Lewis he was exceedingly glad he had come to Launceston, having known him for a considerable time at Campbell Town, where his house was conducted most respectably, and equal to any in the colony. 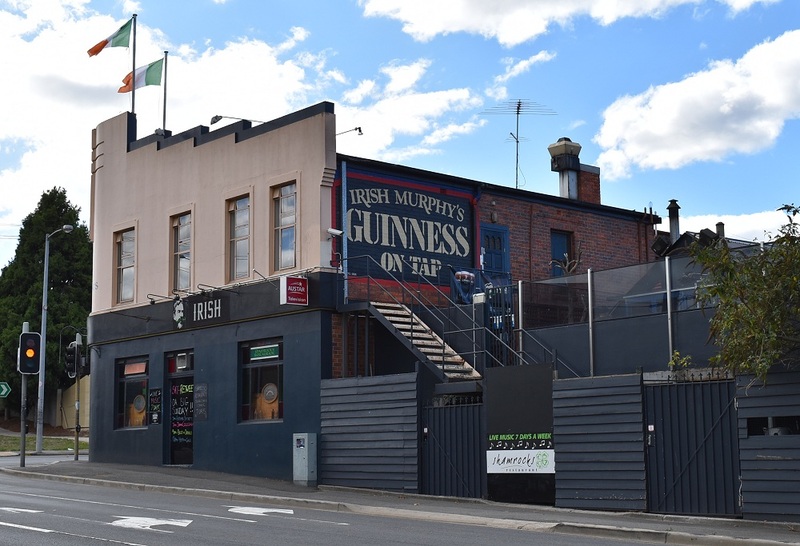 Michael O’Meara, Hibernian Hotel, Bathurst-street — Not well furnished and a pack of cards found by the Police Magistrate on the tap-room table — cautioned.— Granted. The applicant stated, that this (on his part) was merely an application pro forma. He would, if the magistrate approved of such an alteration, remove his “license” to the premises formerly occupied by Mr. King. 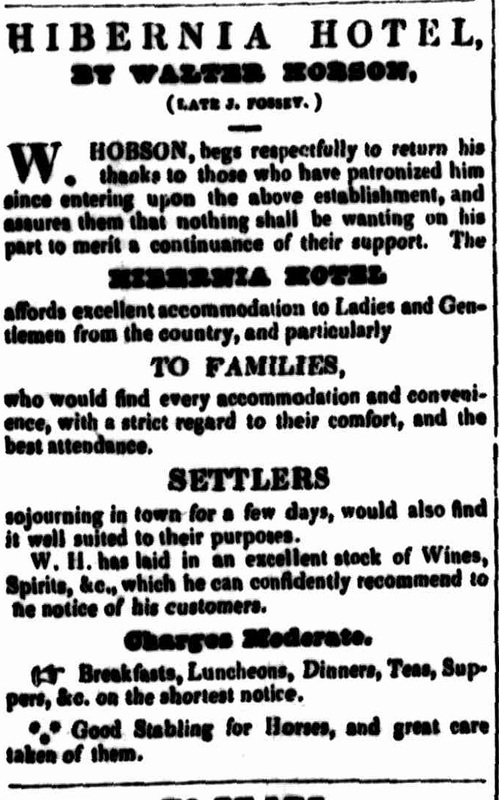 In granting the application, Mr. Tarleton remarked, that he should throw no obstacle in Mr. Watford’s way ; he believed him to be quite respectable, and was of opinion, that a “licensed house” was much more needed In the neighbourhood to which he was about to remove, than in that from which his license would be taken. John Green, Hibernia, corner of Bathurst and Brisbane-streets. The Police Magistrate said it was in a bad neighborhood, but well conducted. John O’Neil, Dove Inn, Bathurst-street, formerly the Hibernia Hotel. Joint O’Neil.-The Police Magistrate said the house was not wanted; it was it a bad neighborhood, and a bad house. Mr. Douglas said eighteen years ago that house was the best in the place, and was the favorite resort of the country gentlemen. Mr. Pitcher kept it, and enjoyed an extensive trade. It was curious, too, that then there was one more public-house in the neighborhood than now. It lost its license by its beitg transferred to the house of the same name. It possessed good accommodation, and the applicant was a steady man. Refused on the ground that the house was not required. 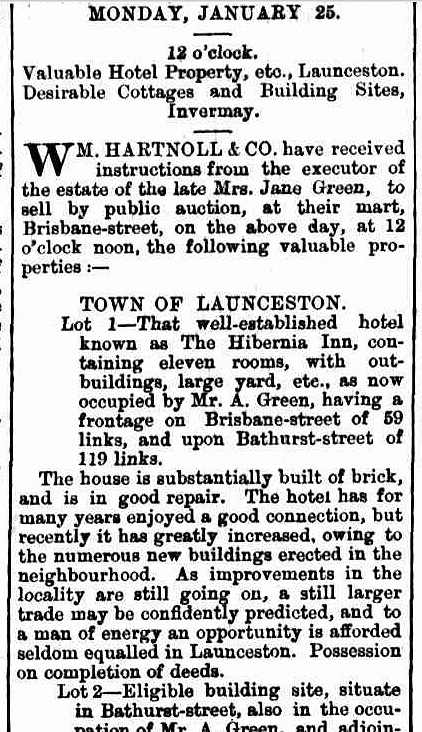 John Green, Hibernia Inn, Brisbane and Bathurst-streets. On tile application of the Police Magistrate the name of Mrs. Jane Green was substituted, as Mr. John Green had died since the application was sent in. Mrs. Green was a very proper person, and had really been managing the house for some time past. Granted. 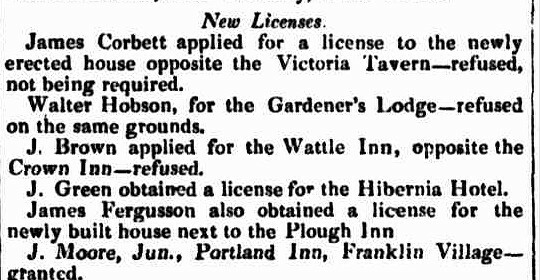 Breaches of the Licensing Act.-Jane Green, the occupier of the licensed house known as the Hibernian Inn, Brisbane and Bathurst-streets, pleaded guilty to an information charging her for that she did not on Sunday, 25th January, keep her licensed house closed, except for the ingress and egress of travellers, whereby she rendered herself liable to a penalty not exceeding £20. together with all costs and charges.-The magistrates inflicted the mitigated penalty of 20s. and costs, 7s. 6d. 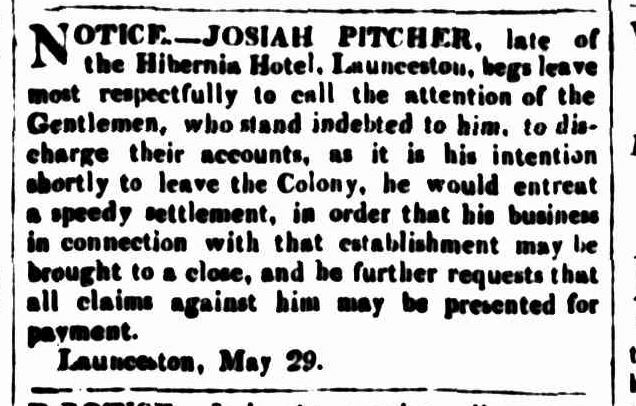 Our obituary records the death of Mr Josiah Pitcher, of Prospect Village, a very old and respected colonist. 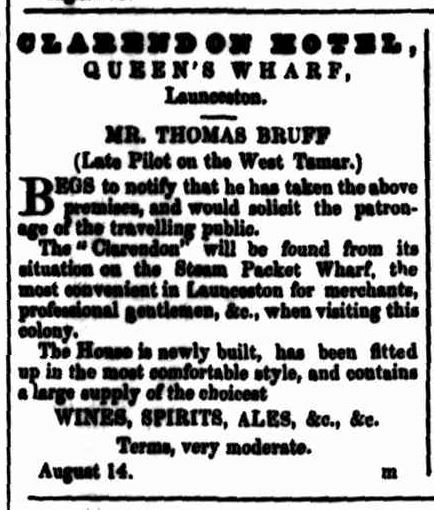 Mr Pitcher in the year 1836 kept one of the few respectable hotels of that time in Launceston — the Hibernia in Bathurst-street. At that period it was an inn, frequented by the most respectable colonists from the country districts, visitors from other colonies, and town residents. It stood on a par in point of respectable colonists with the original Cornwall Hotel in Cameron-street. Mr Pitcher realised a competency and retired to Prospect Village, where he has kept, the “Rising Sun Inn” for many years. He occupied much of his time in vine growing, wine and mead making and the liquors he turned out were a credit to himself and the colony. attendance, and the total amount of the sales was £5060. 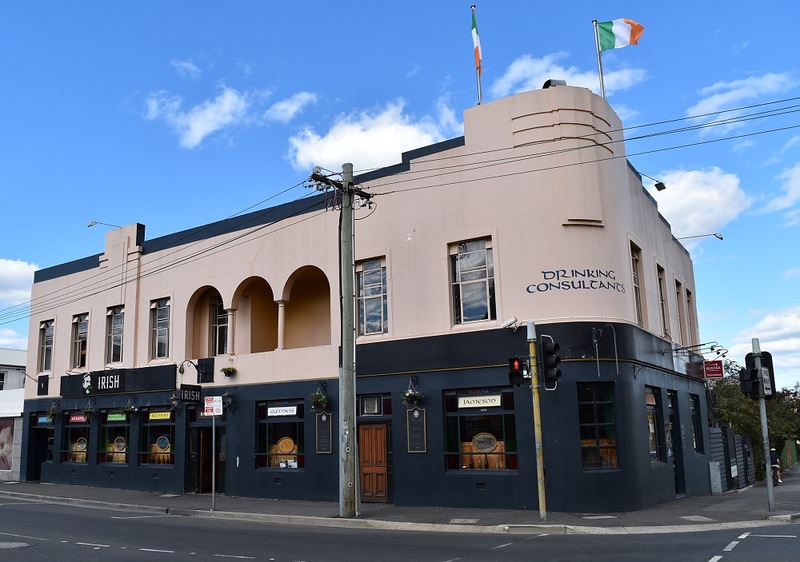 PERMISSION TO SELL.-George Green was granted permission to sell liquors at the Hibernia Inn, corner of Brisbane and Margaret streets, under the license recently held by Alfred Green, until the next licensing meeting. Robert Smillie was granted permission to sell liquors in an open booth at the Denison Gorge on the 29th inst., at a cricket match. 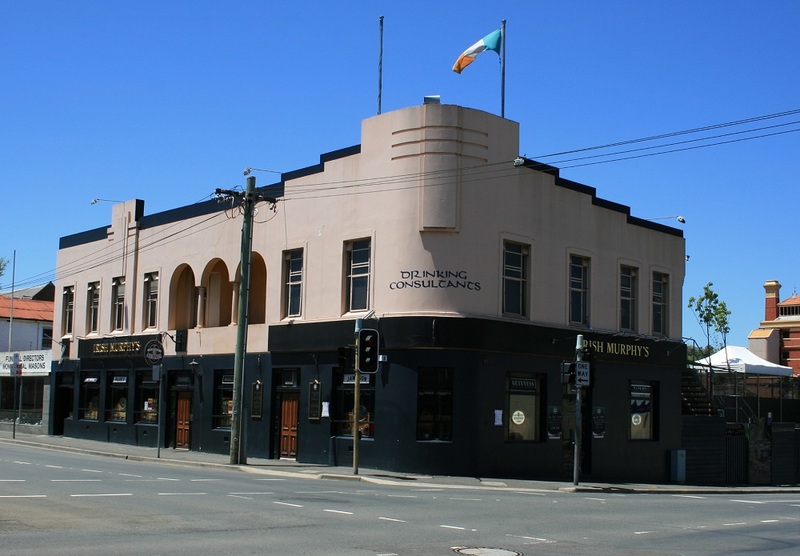 George Green, licensee of the Hibernia Inn, Brisbane and Bathurst streets, was charged with having on Sunday, May 5, given ingress to his house to persons who were not travellers, lodgers, or inmates. Hon. R. Byron Miller (Miller and Miller) appeared for accused. John Upton Fletcher, tailor, said on Sunday last he was going along Brisbane-street to church and passed the Hibernia Inn; two or three men were standing on the pathway smoking and swearing; two men went into the gateway of the hotel; he met a constable and gave information. 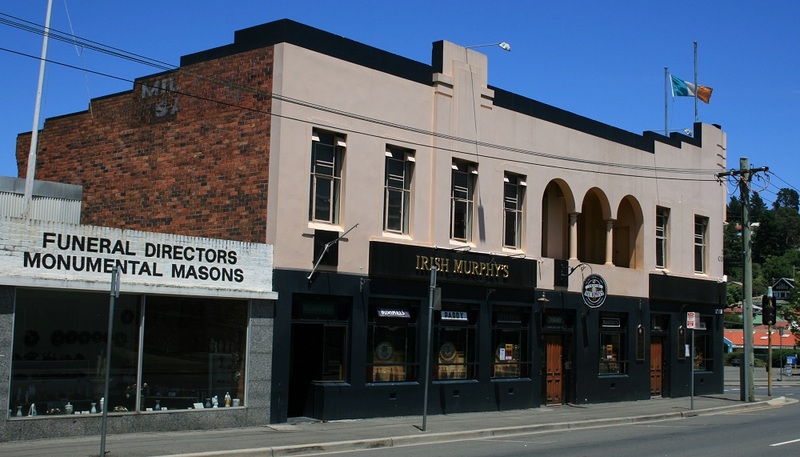 Robert Moir, sergeant of police, said he visited the Hibernia Hotel on Sunday at 12 10 p.m.; knocked at the Brisbane-street door, but got no answer; heard the shuffling of feet, and knocked a second time; the door was opened by the landlord; he went inside and searched the house, but found no one; he left Constable Gandy outside to keep watch. 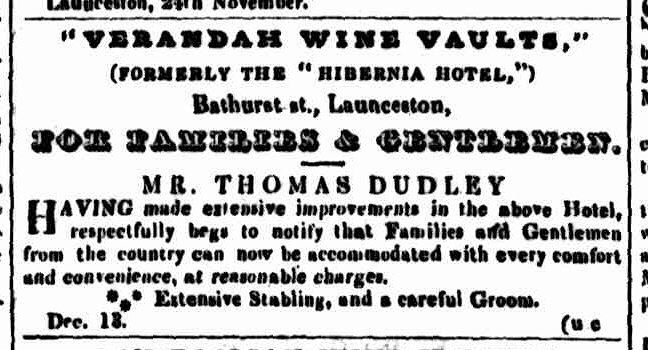 Constable William Gandy said he stopped outside the hotel, and heard a noise in the yard; he looked over the fence in Bathurst street, and saw four men running round from the direction of the house towards the back of the stable; he (witness) went down Brisbane-street, and saw four men running down a waste allotment of ground along the side of the hotel; they got over the fence facing Bathurst-street. Mr Miller did not think it would be necessary to make a defence, the evidence being insufficient to substantiate the charge. The case was dismissed. Superintendent Coulter, during the hearing of the case, spoke strongly against influence having been brought to bear to suppress evidence. 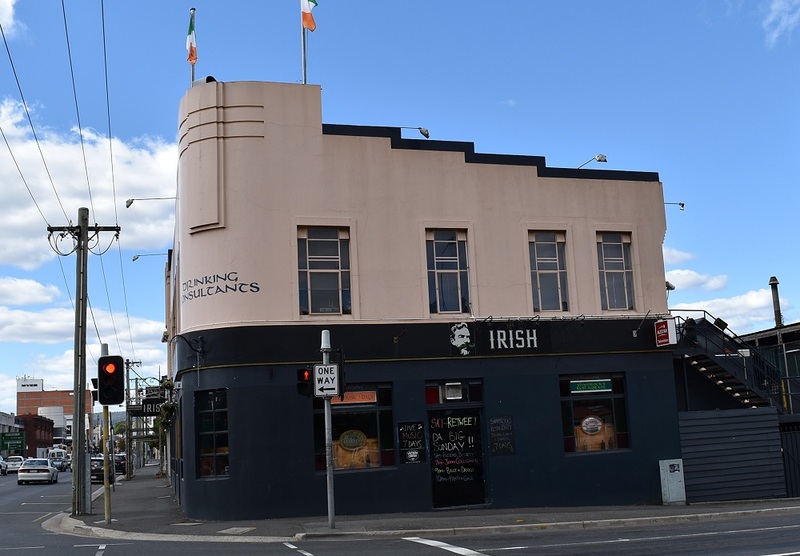 Obituary.— The death is announced of Mr George -Green, the well-known and popular landlord of the Hibernian Hotel, Brisbane and Bathurst streets. The deceased was the second son of the late Sergeant John Green, of the 96th regiment, and for many years he was employed as a carpenter at Messrs. J. and T. Gunn’s. Some years ago he was working at the Daily Telegraph office effecting improvements when he met with an accident which caused an injury to his spine. 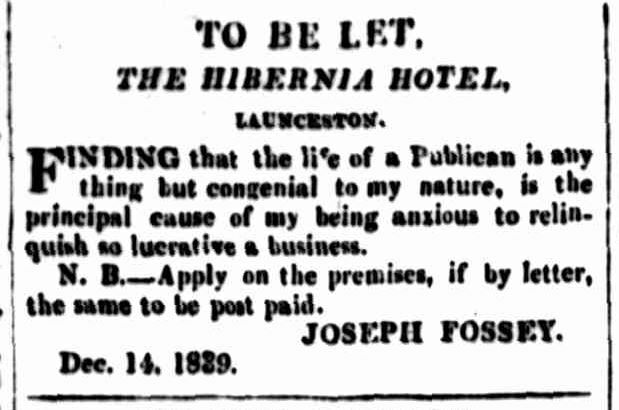 He recovered sufficiently to walk about as usual, but he was incapacitated from following his avocation, and be took on the business of hotel-keeper at the Hibernian Hotel, where his mother had carried on a lucrative trade for many years, About two years ago the deceased went into decline, and although skillfully treated he succumbed to the malady yesterday. 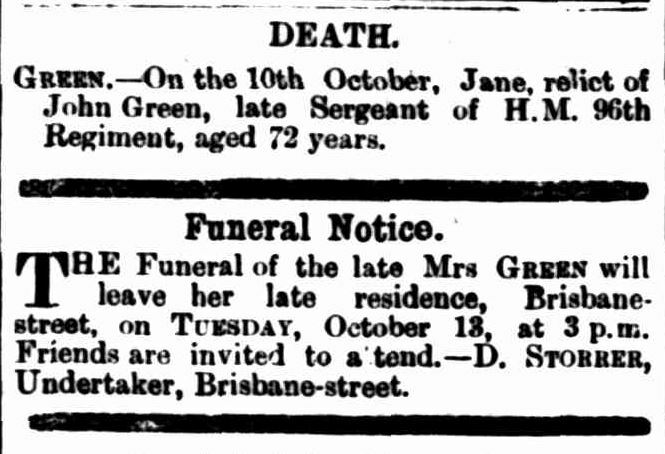 The late Mr Green leaves a widow and family, some of whom are grown up. This entry was posted in Bathurst Street, Brisbane Street, Hotel and tagged location, no photo, photo, still operating by Xenith. Bookmark the permalink.